Transforming restaurant leftovers into garden gold. Peter Gallins runs his hand through a trough of coarse black powder. Some might call it dirt. But this is special dirt. It started its journey last spring in a restaurant or cafeteria kitchen, perhaps as an onion skin or an orange rind. Instead of heading to a landfill, the scraps found new life here at Gallins Family Farm near Mocksville. Twenty-five tons of fresh food waste known as “windrows” sit in long mounds on a concrete slab in an open-sided barn. Studded with lemon peels and watermelon rinds, and threaded with ribbons of paper napkins, these piles teem with life: Bacteria, insects, worms, and fungi gorge on a buffet of leftovers. By March, nature will have transformed the waste into Carolina Dynamite — rich, nutritious compost for nourishing spring vegetable and flower gardens. Nationwide, 35 million tons of food were discarded in 2013; less than 5 percent of it was recycled. The packed quarters of a landfill contain little oxygen. Without oxygen, a broccoli stalk breaks down and creates methane. Although methane is natural, too much of it traps heat in the atmosphere, which contributes to climate change. Peter, who’s 28, hails from Winston-Salem. Lyndsy, also 28, grew up in Arizona. Both graduated from the University of Wyoming; he with a degree in agronomy, and she with a biology and wildlife management degree. As undergraduates, the two operated a student farm and a compost operation that processed more than 170 tons of food a year. The couple moved back to North Carolina in 2011, part of a new generation of young farmers interested in sustainable agriculture. In 2012, they bought 86 acres of rolling farmland down a dead-end road that meanders past lush fields of soybeans. Chickens and goats roam nearby, a few of them relaxing in miniature A-frame houses on wheels that the Gallinses move around to help fertilize the soybean fields. Empty silos and an old milking barn, remnants of a former dairy farm, still stand. They started the composting business with one flatbed dump truck and one employee, hauling about 850 tons of food waste last year from nearby colleges, businesses, and restaurants. This year, they’re on track for 1,500 tons. 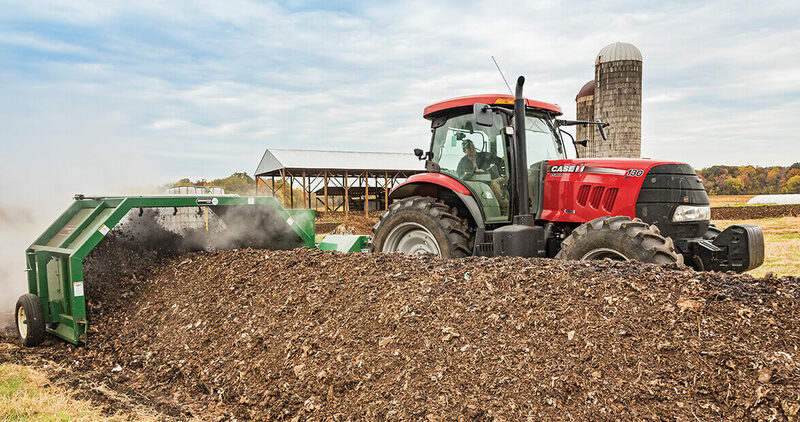 It’s a comparatively small operation: Larger North Carolina composting companies and their flotilla of trucks pick up as much as 50,000 tons a year. Most of the discarded food is fruits and vegetables, although meat can also be composted. The food waste dries in the open-sided barn for about two months. As microorganisms begin to break down the food and paper — both are necessary to create a balance of carbon and nitrogen — they generate heat. Temperatures inside the mound can reach 140 degrees, as hot as water in a dishwasher, which kills the harmful bacteria. Temperatures inside the mound can reach 140 degrees, as hot as water in a dishwasher, which kills the harmful bacteria. After the waste has dried, the mounds are moved to a nearby pasture, which looks as if a giant mole has burrowed underground. Three times a week, Peter fires up the windrow turner, whose paddles fluff the compost, allowing it to breathe. For the next four months, the compost cures. From there, Peter dumps the dried compost into a screener, and then into an old feed hopper from the dairy farm. At the end of the hopper, he sits in a chair and fills bags of Carolina Dynamite by hand.